*Meal Plan: Breakfast and dinner are Chef's Choice. Boxed lunch or shore lunch kit. *Shore lunch kits include pots, pan, plates, utensils, spatula, oil, breading, potatoes, tartar sauce, tin-foil & dish soap. DOES NOT include a heat source. ​*Meals Included: Dinner on arrival day. 3 meals on full days. Breakfast on departure day. Includes lodging, meals, bait and fish processing. Add a boat rental for $180 per day or guided boat for $450 per day. 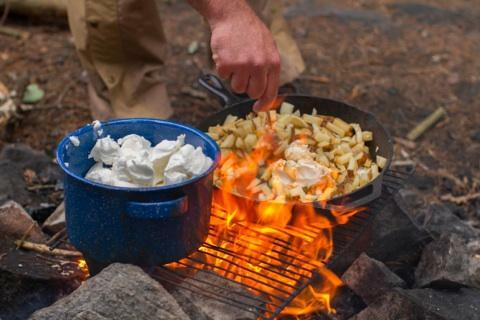 ​*Shore lunch kits include pots, pan, plates, utensils, spatula, oil, breading, potatoes, tartar sauce, tin-foil & dish soap. DOES NOT include a heat source. 18ft Lund Outfitter, 60 Hp motor, trolling motor, GPS with LakeMaster chip and graph, depth finder on front trolling motor and back (graph), live well, net and anchor. Bring your own boat or float plane. Docking is FREE during your stay. Boat slip with electric hook up is included when you stay with us. Guests should bring their own extension cord. Reserved spots available: $10 per boat per night. Vehicle, boat trailer parking, and boat launching at Young’s Bay for a reasonable fee.